Fishermen like to complain when they are not catching fish. They complain about the fishing, the weather, the lack of bait, other fishermen, their spouses, their boss and global warming or global cooling. Fishermen also practice the art of rationalization and they are nothing if not philosophical about their sport — in a bumper sticker sort of way: “A bad day of fishin’ beats a good day of working,” is a popular bit of fishing wisdom you will find affixed to rusting trucks and flashy SUVs. Well, I’m here to tell you that it is not alway true. An Australian fisherman named Tran Van Lanh had a bad day of fishing and I bet he wishes he had stayed at work. You see, Tran got eaten by a croc. Honest. On Martha’s Vineyard we don’t have to worry about crocs, or snakes or head hunters. We have it pretty good. Our biggest risk is hooking ourselves in front of our friends. A bad day of fishin’ on the Vineyard is no fish. Not so in Australia. According to the Outdoor Hub news service, which provides me with a steady stream of news stories that make me happy to be on Lobsterville beach, the 57-year-old fishermen was killed last Monday after he was ambushed by a crocodile in Australia’s Adelaide River. The partially albino croc, according to the Australian news service SBS, had a white head and was well known along the river as “Michael Jackson.” Guess the Australians didn’t get the memo, or maybe it is too far away for Al Sharpton to cause a fuss. Not a good idea to try and unsnag a line in a croc-infested river. “Police and rangers scouring the crocodile-infested river by boat on Monday night shot and killed a 4.5 meter crocodile (that’s almost 15 feet) and the man’s body was recovered later that night. “The Adelaide River is well known for its Jumping Croc tours, where boats travel the river and crocodiles jump for meat attached to hooks. “Michael Jackson was one in a million, and unfortunately being an albino would have been picked on by all the others, it’s a big pecking order,” said Rob Marchand, owner of Wallaroo Tours, which runs Jumping Croc cruises across the river from where the man was taken, the news service reported. I do not think Mr. Marchand is an objective expert. One-in-a-million? So the next 999,999,999 fishermen who jump in the river to unsnag lures should get out just fine? By the way, he rejected the suggestion that the Jumping Croc tours were encouraging predatory behaviour on the Adelaide River. “I’m sure crocs knew how to eat people a long time before we come along,” he said. So next time you’re complaining about a bad day fishin’, think of poor Tran and say a little prayer. Of course, F is pretty much what recreational fishermen on Martha’s Vineyard have been saying for years as they’ve watched the quality of the bass fishing decline. The Draft Addendum includes a suite of management options to reduce recreational and commercial harvest along the coast and in the Chesapeake Bay. Specific options to be considered include bag, size, slot and trophy size limits for the recreational fishery and quota reductions for the commercial fishery. The Massachusetts Division of Marine Fisheries (DMF) will hold a series of hearings on behalf of the ASMFC the first week in September but does not plan to make state specific recommendations and hold hearings on them until later this year. One thing is certain: new rules will be in place when the bass return to Massachusetts next spring. DMF is not planning to hold an ASMFC hearing on the Vineyard but will hold a hearing on Nantucket on Sept. 2. That makes no sense to me. Nantucket has a small commercial fishery, a much smaller number of recreational fishermen and is in the middle of the ocean. Other hearing sites include: Massachusetts Maritime Academy (Sept. 2); Gloucester (Sept 3); and Braintree (Sept. 4). Now is the time to comment. Yapping in the tackle shop means nothing. Public comment will be accepted until 5 pm, September 30, and should be forwarded to Mike Waine, Fishery Management Plan Coordinator, 1050 N. Highland St, Suite A-N, Arlington, VA 22201; 703-842-0741 (FAX) or at mwaine@asmfc.org (Subject line: Draft Addendum IV). For more information, contact Mike Waine, at mwaine@asmfc.org or 703-842-0740. 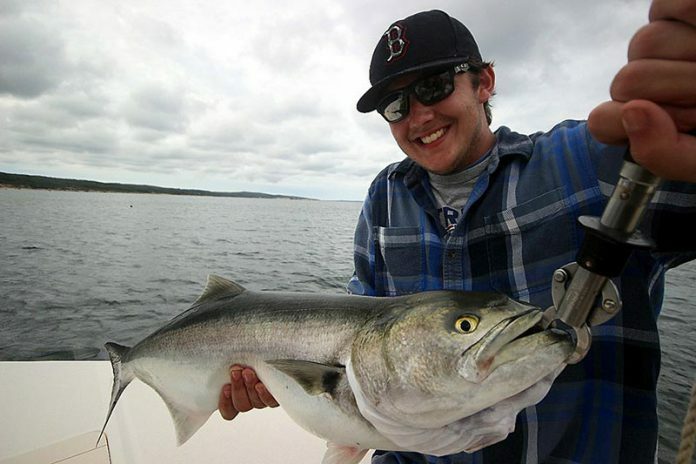 The 69th Martha’s Vineyard Striped Bass and Bluefish Derby (mvderby.com) is only weeks away. The Derby begins on Sept. 14 and ends October 18. More later.